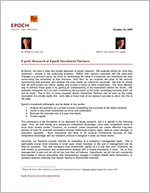 Equity Research at Epoch Investment Partners - Epoch Investment Partners, Inc.
At Epoch, we have a clear and simple approach to equity research. We evaluate stocks for what they represent – access to the underlying business. Rather than concern ourselves with the short-term changes in a security’s price, we focus on determining the value of a business, and identifying the risks surrounding the ownership of that business. Only then do we consider the price of the security representing that business, and whether the price meets our criteria for purchase. We look for stocks that will both protect our clients’ capital, and provide a return on their investments. The most effective way to achieve these goals is by gaining an understanding of the businesses behind the stocks. We evaluate companies as if we were considering the purchase of the entire underlying business itself, not just its stock. This is why, in many respects, Epoch Investment Partners can be seen as the public equivalent of a private equity firm. Let’s take a closer look at our research process to show why this is the case. Analyze the business as a private investor considering the purchase of the entire company. Invest in only those businesses we know and understand. Evaluate the business over a 3 year time frame. This philosophy is the foundation of our approach to equity research, and it is applied in the following ways. First, we look closely at a company’s competitive advantage. Over time, competition tends to drive down excess profits.1 However, on occasion, some companies can create effective long-term barriers of entry for potential competitors through intellectual property rights, balance sheet strength, or execution capability. Such companies are likely to be superior investments because of their competitive advantage, and our research process is designed to seek out these stocks. Secondly, our research process includes an evaluation of a company’s management team. This is particularly crucial when investing in small caps, where missteps on the part of management can be fatal for investors. The best managers treat shareholder capital as if it was their own. Therefore, we look closely at governance and compensation policies with a simple philosophy in mind – tell us how management is paid and we will tell you how they will behave. Specifically, we will not own companies that engage in obtuse accounting, lack transparency, engage in multiple related party transactions, or possess takeover defenses that appear harmful to shareholder interests. Thirdly, we have a certain way of gauging a company’s financial health. We use free cash flow as our primary metric, rather that the earnings-related metrics dictated by conventional accounting. It is free cash flow and its intelligent use that builds shareholder value. Only five applications of free cash flow exist – cash dividend, stock buyback, debt pay down, acquisition, and reinvestment in internal projects. We believe that, for each company under consideration, one or a combination of these choices will best serve shareholder interests. Through our research, we determine whether or not a company is engaged in the proper set of cash flow deployment strategies. In doing so, we pay particularly close attention to balance sheets, with a preference toward companies that are free of debt or that possess financial leverage to a lesser degree than their competitors. Especially in the current environment of rising interest rates, we believe that our free cash flow orientation and our aversion to highly leveraged balance sheets is of great benefit to our investors. Once we have examined the business, evaluated management, and measured the financial health of the enterprise, we seek to identify a catalyst that will allow the company’s intrinsic value to be fully realized by the stock market. Oftentimes, it is clear that the marketplace has failed to appreciate management’s business plan and, in such instances, the catalyst for value realization is simply time. Therefore, we tend to hold securities in our portfolios for longer periods of time than many other institutions. Whereas the average equity mutual fund portfolio turns over almost every 10 months, Epoch’s average holding period approaches three years. This gives management the time it needs to execute its growth strategies, which, in turn, translates into consistent returns for the patient investor. At other times, companies are able to transform both themselves and their industry, and the first investor to recognize this transformation can reap enormous returns. Epoch has also recognized that entire industries and geographies can undergo paradigm changes that, while massively influential in the long-term, are overlooked in the short-term by many investors. The emergence of energy supply issues and the ascendancy of China within the international markets are examples of such occurrences. Epoch’s approach to equity research, in partnership with our long-term holding philosophy, has allowed us to identify these investment opportunities, resulting in the growth of our portfolios over time. At times, we make purchases that appear out of step with the general consensus. We are entirely comfortable with this style of investing. After all, it is difficult to differentiate oneself by following the crowd. Most importantly, however, we believe that it is almost impossible to build wealth by subscribing to consensus thinking. When a stock becomes widely popularized, this popularity is often fully reflected in the price of the security. We judge the worth of an investment not by its popularity, but by the strength of its fundamentals. Sometimes, this means we must go against the grain, and we are more than happy to do so. Ultimately, equity research is the identification of a business with superior risk/ return characteristics that can be bought at a price below estimated fair value. Fair value is determined by what a third party would pay for the business, should that third party choose to purchase the company in its entirety. It is not uncommon for us to have some portfolio holding companies become part of merger or acquisition activity over the course of a year. All of the involved parties in those instances – the management, the shareholder, and the acquiring party – are seeking to accomplish one objective, the maximization of the value of the business. If we do our job right, our clients will win from this approach to research. 1William W. Priest, “Rate of Return as a Criterion for Investment Decisions,” Financial Analysts Journal July-August 1965. On Bloomberg Surveillance with Tom Keene, Co-CIO and Portfolio Manager David Pearl discusses how to avoid the pitfalls of value traps by investing in companies who can grow their free cash flow. He also talks about the currency dilemma within Brexit. The information contained on this website is distributed for informational purposes only and should not be considered investment advice or a recommendation of any particular security, strategy or investment product. Information contained herein has been obtained from sources believed to be reliable, but not guaranteed. The information contained on this website is believed to be accurate as of the date submitted, and is subject to change. Any performance information referenced on this website represents past performance and is not indicative of future returns. Any projections, targets, or estimates on this website are forward looking statements and are based on Epoch’s research, analysis, and assumptions made by Epoch. There can be no assurances that such projections, targets, or estimates will occur and the actual results may be materially different. Other events were not taken into account in formulating such projections, targets, or estimates may occur and may significantly affect the returns or performance of any accounts and/or funds managed by Epoch. To the extent this website contains information about specific companies or securities including whether they are profitable or not, they are being provided as a means of illustrating our investment thesis. Epoch’s clients may or may not have owned these securities at the time this material was prepared or is accessed by the reader. References to specific companies or securities Epoch’s clients own or may have owned are not a complete list of securities selected for clients and not all securities selected for clients in the past year were profitable.